Another test, provided by donation from CRX. I figured a classic XM-L2 would be a good one to test for the heck of it. I was surprised when it blew at only 5.5A. It looked like it would going to keep going pretty good. The bond wires are obviously the weak link on these last gen emitter. The newer ones are not limited by this and is a large part of why they can handle so much more power. Although I think we are reaching the limits of the 3535 footprint’s ability to shed heat, I would like to see an XM-L3 with the latest die tech to test this hypothesis. I know that the 5050 footprint handles a non-DTP star WAY better then an 3535. Besides the early death it was doing pretty good. What’s interesting to me is that at the very end, it was giving 1497 lumens from 5.5A with a Vf of 4.00 volts for an efficiency of right around 68 lumens per watt. 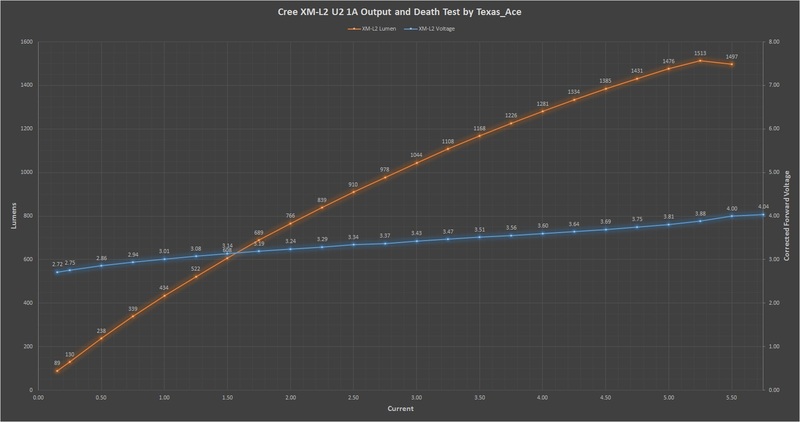 If Cree can get the efficiency up in the XM-L3, as well as better thermal handling, we might see over 2000 lumens at the high end (before death). The XM-L3 should easily surpass 2000 lumens since the XP-L2 is making ~2200 lumens @ 10A and didn’t die even at 15A. OK. I guess I’m not paying attention! Nice test. The earlier XM-L2’s went to over 9A before dying, so the same production change took place as with the XP-G2. Btw TA, did you ever receive that small light that I sent you to check your calibration against mine?, it has been many weeks now since I sent it. Yeah, thats what I am thinking as well. I just killed another XM-L2 today at around ~5A when testing the VG10 driver which I did not expect. I was curious about that light you sent as well, nothing has shown up yet but then a lot of my overseas orders have been delayed since Christmas. They all started showing up in the last few days though so hopefully it is not far behind. lol, no worries. I have been putting a bunch of these up so it is easy to miss one. Thats why I am spreading them out instead of just posting them all at once. Still have a few more ready to go I will post over the next few days. TA, I am amazed at the volume of work you can put out! Your willingness to share and take the time to explain is greatly appreciated!!! When I jump into a hobby, I tend to jump all the way in lol. Plus I got so much out of this sire I figure it is the least I can do to give some back. Is there any way to distinguish an old or a newer type XM-L2, other then trying if it dies at 6A ? Sorry friend, I am unsure. I have never heard of a way… I was wondering if some of the difference could be explained by a higher vf in the newer leds. I haven’t seen any total wattage comparrisons but I know some of the newer xml2s were said to have a higher vf. Edit: looking at the chart now, it doesn’t seem like the led tested had an overly high vf so, IDK? Well, I am wondering sort of the same thing Yokiamy does. I have a spare 7A3 high CRI emitter with a batch date of 2016/07/23. It'll likely never go beyond 4.2 - 4.5A, but seeing those dieing not much above that figure is a tad scary, especially considering the emitter's cooling won't be as good as in Texas Ace's testing hardware. So, would I happen to be under driving my xm-L2 @ only 2.9a? My TaskLed driver, h6cc can do 6a max. 2.9A is a good current for a XM-L2, but, provided that the led is reflowed on a DTP copper ledboard, you can squeeze a bit more light out of it by giving it an amp more. 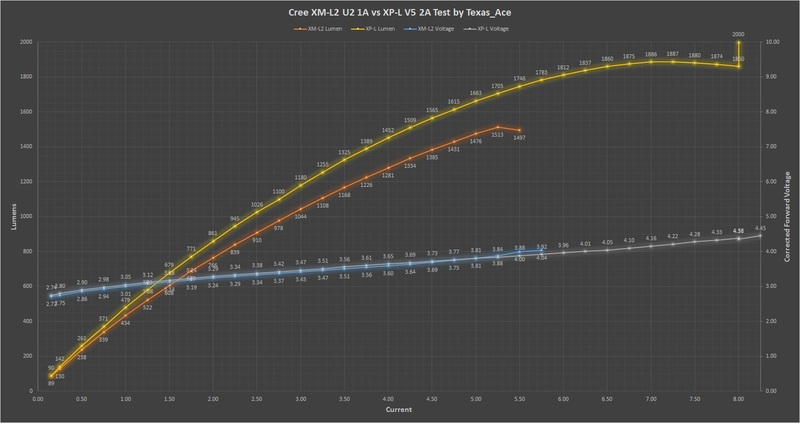 Well, comparing djozz and Texas_Ace’s tests of XML2 vs XPL, I can see that Texas_Ace’s XML2 has a higher Vf. Old XML2 was 3.8v at 6A and only 4.0v at 8A, whereas TA’s XML2 was 3.8v at 5.25A and popped at ±3.9v at only 5.5A. Do anyone know of this is also the case of the XML2 U3 and U4? Has anyone done similar tests on the U3/U4?